Watering your plants with waterwick is easy -- simply refill the reservoir. It takes only a few seconds and there's no mess! Wick & Grow™ is an exciting way of growing your favorite plants without having to worry about watering. By growing your plants with Wick & Grow™, you never have to think about how much or how often to water your plants. The Wick & Grow™ system is effective and wonderfully easy. It starts with a specially designed wick. Inserted into one of the drainage holes at the bottom of the pot, the top half of the wick is in contact with the potting mix. The bottom half of the wick dangles into a water reservoir. Because the wick pulls moisture from the reservoir into the potting mix, the plant is in complete control. 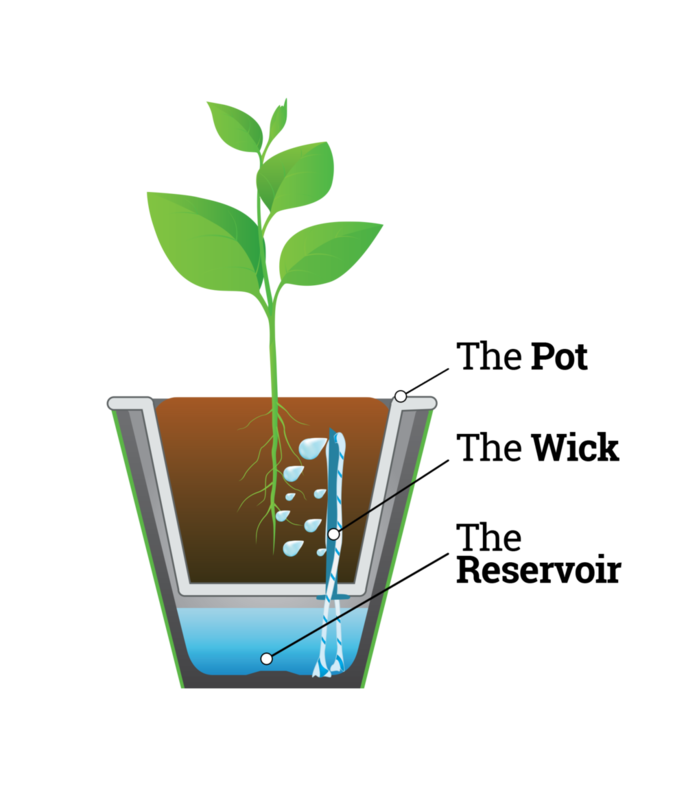 The more water the plant pulls from the soil, the more moisture the wick pulls up from the reservoir. This means it's super-easy for you -- all you need to do is keep the reservoir filled. Wick & Grow™ has three basic parts. One advantage of Wick & Grow™ is that you can buy plants that already have the wicks inserted -- so you don't have to repot to enjoy a self-watering planter! Enjoy the stylish Wick & Grow™ reservoir the plant comes in at your local garden center or make your own reservoir to fit your home's look and style.